There is a lot of confusion about the term “food allergy” and it is often better to think about the subject under the header of adverse reactions to foods. Within the medical conditions listed under adverse reactions to foods, there are many different mechanisms of reactivity. Unfortunately, we only have a limited number of validated diagnostic tests available and only for certain mechanisms of reactivity. Your medical history and symptoms will go some way towards identifying the possible mechanism involved, and the type of diagnostic test that you require to either confirm or refute a reaction to a particular food. What most people consider as “allergic” reactions are those caused by “IgE mechanisms” of reactivity. Whilst validated tests are readily available for this mechanism of reactivity, they are not suitable for confirming or refuting adverse reactions involving other mechanisms of reactivity. 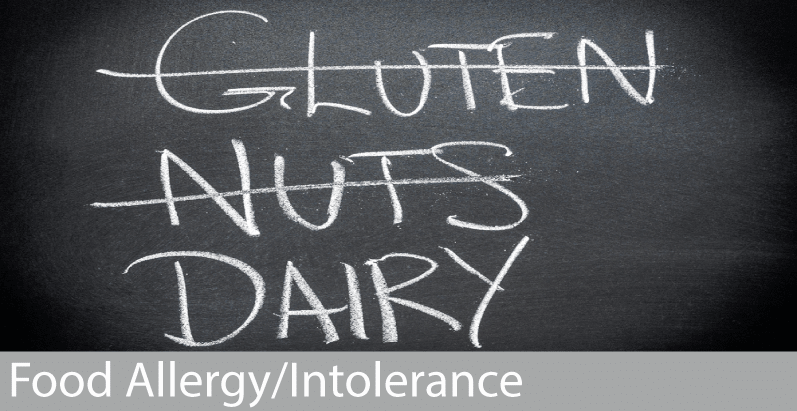 Those adverse reactions that are “non allergic” are sometimes bundled together under the term “food intolerance”. IgE mediated allergies occur when your immune system reacts to a particular protein(s) in a food. It is a learnt and memorized response causing consistent reactions even when exposed to tiny amounts of the food. The reactions tend to occur very fast after the food is ingested. Reactions can be mild with itching and tingling in the mouth and throat, to one that is severe and life-threatening – so called anaphylaxis. The main causes of IgE mediated food allergy are cow’s milk, eggs, peanuts, tree nuts, fish, shellfish (crustacea and molluscs), soy, fruits and vegetables. The relative frequency of the foods varies according to the age of the population studied. The “Pollen-Food” syndrome or “Oral Allergy Syndrome” is a type of IgE mediated allergy to fruits and vegetables secondary to an allergy to pollens; this is due to the allergenic proteins in the foods and pollens being similar and cross-reacting. Alternatively, food intolerance does not involve the body’s immune system and is due to the way that the body, and in particular the bowel, “handles” a particular food. Symptoms usually consist of bloating and stomach pains and sometimes diarrhoea. These symptoms usually occur many hours after ingestion, and often there is a threshold above which the symptoms occur, and below which, the food is tolerated. Skin prick testing can help to identify IgE mediated food allergies or exclude them. Blood tests can also be used to assess the same type of response. However, if a food causes an adverse reaction by an intolerance mechanism these tests will be unhelpful, and a negative test will not exclude the possibility that the food is responsible for the symptoms. Dr Orton works closely with a specialist Allergy Dietitian – Tanya Wright. She is able to safely assess, modify and direct a person’s diet to determine whether this intervention results in improved symptoms. She can also provide practical advice on food labeling, shopping when you have an allergy, and recipe ideas. Copyright © 2015 Dr David Orton. Website developed by Brandlective Communications.